The very word 'mystery' is exciting. It instantly conjures up visions of ruined castles, secret passageways, lost treasures, brave detectives and dastardly villains. Most of all though, it suggests an enigma - a puzzle to solve, a question that characters as well as readers are trying to answer. What a wonderful concoction of mysteries! I loved dipping in and out of this book. It didn't take me long to finish all of the stories, which were each delightful in their own way. 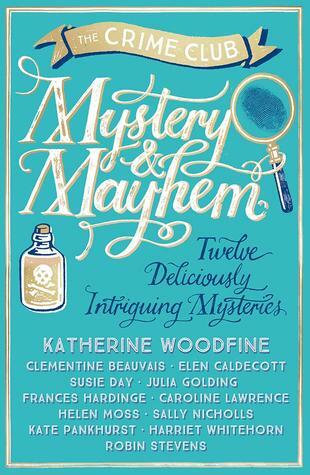 My favourite story out of all of them was definitely the Marsh Road Mysteries one, Rain On My Parade by Elen Caldecott, as I really love these characters. I really enjoyed The Mystery of Room 12 by Robin Stevens. I didn't have a clue how they had managed the mystery until it was revealed. Another favourite was Caroline Lawrence's The Mystery of Diablo Canyon Circle. I loved the setting and meeting all the interesting residents. The Mystery of the Pineapple Plot by Helen Moss was excellent and well plotted too. Not to mention meeting the feisty Emily, in Susie Day's, Emily and The Detectives. These are simply fantastic tales which any Middle Grader will love. They are easy to get lost in and thoroughly entertaining. They have opened a pathway to authors I haven't read before and I look forward to exploring their work further.